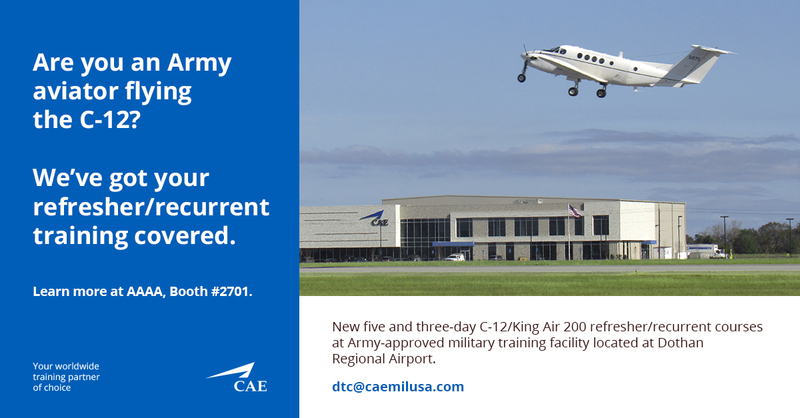 CAE is the global leader in training for defense, civil aviation and healthcare. We are a globally-recognized training systems integrator providing comprehensive training solutions to the U.S. Army Aviation community. At the Army Aviation Association of America (AAAA) Mission Solutions Summit, we will once again showcase our Dothan Training Center that continues to provide the Army with comprehensive fixed-wing flight training. Stop by to learn more about our C-12 recurrent training course options as well as our Upset Prevention and Recovery Training (UPRT) course. We will also highlight CAE’s world-class training and simulation capabilities, including solutions for remotely piloted aircraft (RPA) training and recent innovations such as the new CAE 700MR flight training device for helicopter mission training. Our team looks forward to welcoming you to our booth (#2701 – next to the AAAA Community Briefing Booth) to further discuss our breadth of training and simulation capabilities that can help the Army enhance safety, efficiency and mission readiness. To schedule an appointment to meet our team during AAAA 2019, please email [email protected].